As you know, it’s age groupers that make up the vast majority of folks that participate in this sport. Although I’ve interviewed more than a few professional triathletes, recently however, I’ve wanted to focus on age groupers in my ongoing Ten Questions With… series. This week’s interview continues down that path. Kim Schwabenbuaer is an age grouper (albeit a VERY good age grouper) who grew up in Pennsylvania and now lives in the general Pittsburgh area. 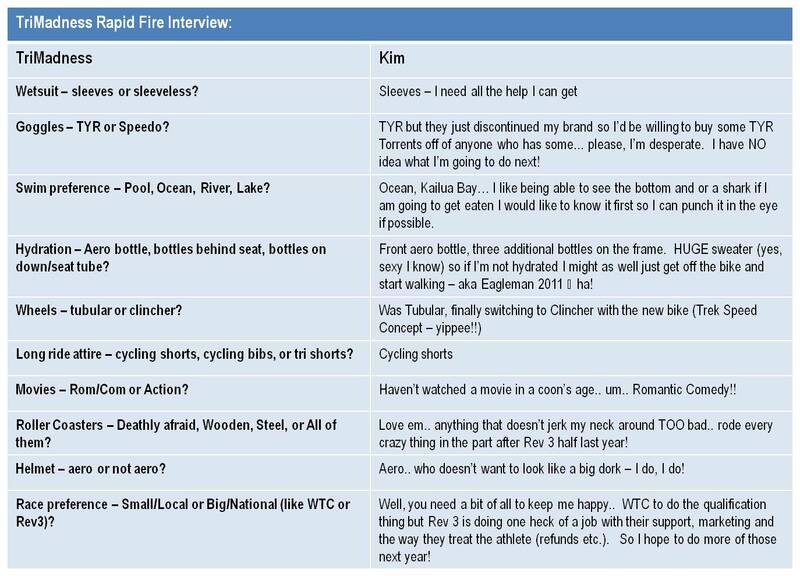 She and her husband are both quite active – Kyle is an outdoorsman (check out the TV show he works for here), and obviously Kim is big into triathlon. 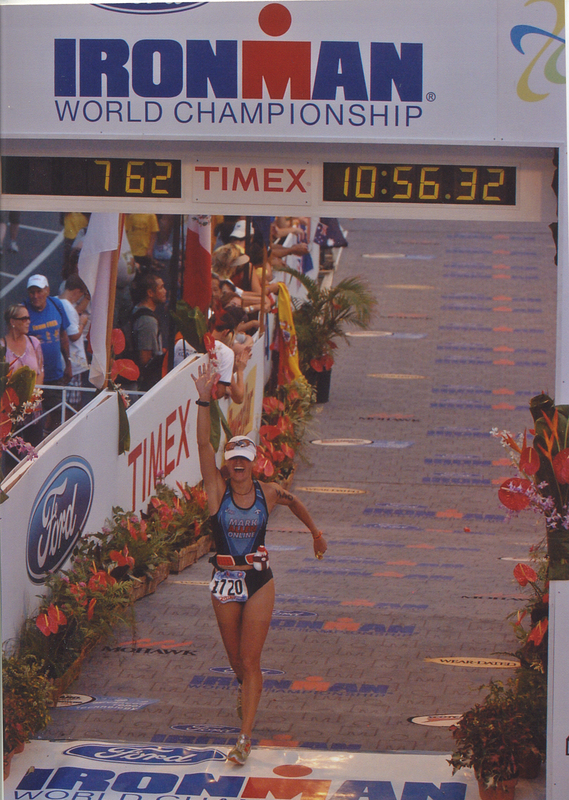 Kim crossing the finishline at Kona in 2008. Kim attended Penn State back in the day, and ran both track and cross country as a walk-on athlete. Ultimately, Kim became one of the better runners on the team, and was captain of both the cross country and track teams. She studied Nutrition Science & Applied Fields, and while originally wanted to be a chiropractor, Kim now is a certified dietician, triathlon coach, nutrition coach and motivational speaker. So…without further ado, allow me to introduce you to this week’s subject for Ten Questions With…Kim Schwabenbuaer! TM: How did you get your start in triathlon? Was it a natural progression after your running career at Penn State ended, or did someone motivate you to give it a try? TM: What do you enjoy most about our sport? KS: Dang it, I have a terrible time with this question because it’s everything… the amazing people in the sport, the challenge of seeing just how good I can get, the traveling to new places and events, learning where my limitations are both physically and mentally and then pushing the envelope, seeing how it changes people lives from complete couch potato to active athlete creating some of the most inspiring stories I’ve ever seen!! Everything.. I like everything about the dang sport.. happy J? TM: You’ve had a very successful career so far, including qualifying for Kona. What accomplishment are you most proud of? KS: Did anyone ever tell you your questions are hard (but good, you do your research my man!)? I’m so very thankful for the journey I’ve been on since starting this sport. It’s truly changed my life and the way I see the world. It isn’t one accomplishment per say I’m most proud of I guess. It’s the fact that I never stop, even when the chips are down, even when I’m doubting myself and my abilities, even when I’m on the bike in a sling like I was after a broken collarbone in 2009 at the Half Ironman World Championship. It’s scary to dream big, especially when you feel there are plenty of people who think you should just hang it up and move on to the more “important” things in life. I’m just so thankful and blessed that I’ve had people who never let me give up, even when I tossed around the idea, and that it brought me back to the thing that matters most.. the love the of sport and the challenge of the next training session, the next race. Yep, that’s it I think! TM: You’ve raced in all the different triathlon distances. Which is your most favorite and why? KS: Well, with this answer I’m going to seem like a gutton for punishment but I would have to say Ironman. Sure, the short fast ones are fun, but the Ironman takes a different mind-set, a different “tone” if you will. It’s the one where you stand on the starting line and realize that not only will there be pain, but there will be 10-17 hours of pain but that when you run up on that finish line and you hear that roar of the crowd, that you know you are a different person than you were when you started, that all the hard work and sacrifice came together so that you could walk those final steps and say thank you for all the faith, love and strength that brought you there in that moment. Nothing peels away the layers of who we are like racing 140 miles, the highs, the lows, and everything in between.. it’s pretty special. TM: You raced last month at Eagleman. How’d that race go? KS: Eagleman. Hum.. I wouldn’t say it was the race I was looking for, but it was solid. It had it’s high points (the bike) and it’s low points (the run). It’s tough when you don’t feel like you execute your race the way you had planned or when things go wrong and you just can’t bring them back around. That was Eagleman for me. A solid 7th in the age group, but when I don’t run well.. frankly, I’m never happy. I’m a runner and I can do better than that.. Hopefully, all this run training along with the other factors will come together at the next one! TM: What are your goals for the rest of this season? What does the rest of your race schedule look like? TM: Are you coached or self-coached? How did you land on going that particular route? KS: At this time, coached (Justin Trolle, USAT Level 3, Vangard Triathlon). I did some self coaching for awhile and found it tough to see things from an outside perspective (when to rest, when to push etc.). That’s the beauty of a coach, they can just see things that at the time you are too close to really examine impartially. After meeting Justin at my USAT Level 1 clinic (he was a presenter) he was just a laid back dude in a cowboy hat who seemed to click with me and what I was about. I had no idea if it would work, but we were both willing to give it a try. He’s been great and I can’t thank him enough. TM: What is your most favorite workout? KS: Once again, this could come off as lame, but I like a good old fashion long run through trails. Seeing the beauty of nature plus my legs loving the soft ground, hearing your breath, seeing the way the light dances through the trees at daybreak…it’s almost a spiritual experience. I can’t help but think about how lucky I am just to be healthy and get a chance to live my dreams in moments like that. Ok.. I have to go trail run now! TM: You own your own business (www.fuelyourpassion.net) where you offer triathlon and nutrition coaching, wellness programs, motivational speaking, and more. What aspect of your career do you enjoy the most? KS: I definitely enjoy seeing someone who may never have even ridden a bike before or even remotely call themselves an “athlete” finish their first triathlon. Coaching them through that process start to finish is one of the most amazing experiences thus far. Working on the nutritional aspects is also a fun part, but the feeling they get when they cross the finish line, and knowing that I was a small part of that, is just one special opportunity. In addition, seeing some of my more experienced athletes reach their goals or cut 25 minutes off their previous best half ironman time is pretty cool too. I love talking with them right after the race! I’m like YEAH – that’s why we’ve been working so hard – there it is!! The proof is the pudding they say!! I’m very blessed to say the least. TM: Who, or what, in triathlon inspires you? KS: Everything about this sport inspires me. The people I meet at the most humble, yet driven, inspiring, loving individuals I have ever met. Seeing professionals and age group athletes talking side by side about their struggles, their victories, how they overcame challenges. The Challenged Athlete Foundation athletes are simply put, some of the toughest men and women in the sport. They, and their helpers are just unbelievable. Finally, last but not nearly least, my charity, Ballou Skies that supports research for Muscular Dystrophy inspires me. Ryan Ballou inspires me by the way he never gives up on his fight to raise awareness of this disease and raise money until there is a cure. He never stops, so I will never stop learning, training, competing and giving it everything. TM: (bonus question) What question did you hope that I’d ask you, but haven’t? And what is the answer to that question? KS: What role does your faith play in triathlon? Is that a big part of what you do? My best performance thus far was definitely Ironman Cozumel in November last year where I was the first female amateur and 6th among the professionals. In some ways, I knew I had it in me to have that kind of race, but so much can happen, as we all know, so I never go in expecting it. Especially considering in the four days prior to this race, I had terrible diarrhea (sorry! Gross I know!! It’s true though!). Two days out I could only sip liquids all day and I had no idea if I would even be able to finish the race, let alone race to my full potential. At some point we all know that whatever happens in that race is only so much in our control. If you believe in God or not, you know that some things you can change by adaptation or decisions but others you simply cannot. In those moments is most where I feel my faith well up within me and just allow me to live for that moment, to see this is only a race and I’m so very blessed to get to compete in the first place. When I finally let it go in Cozumel, was when it all came together and that had NOTHING to do with me making it happen. It had everything to do with my belief that I am child of God. I know that we all may not believe the same things, but I’m able to keep going in the lowest of low times because of that one fact. Check out Kim’s website here, her blog here, and follow her on Twitter! Running is a simple thing. We lace up our shoes and head out. 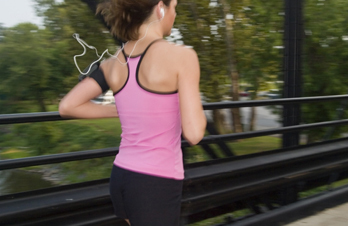 Many of us must have music while we run. While I’ve certainly talked about my need to run with an iPod, I also get running at its simplest. I used to be one of those guys that never left the house without music. Now I rarely wear my iPod when I run. Actually wearing one now seems like such a chore. The wires get in the way. Sweat gets in and destroys the electronics. Too much wax build up on the ear buds. There are just so many things to think and worry about now. All this being said – it’s not as if I run without music. I’ve found that I tend to get a song stuck in my head and it just repeats and repeats – sort of like a broken record. And, for whatever reason, the songs often aren’t that good. I’ve had Disney songs stuck in my head. “Whip It” by Devo. “Over the Rainbow”. Recently, I’ve had a Jimmy Buffett song stuck in my head. You might think it’s one of his more popular songs, like “Margaritaville” or “Cheesburger in Paradise”. Nope. Just a random Buffet song. “Cuban Crime of Passion”. And not the whole thing either. Just the chorus. At this point, I’m not sure which is worse. Dealing with all the iPod crap or having random songs stuck in my head. Last night I had the opportunity to do something I hadn’t done in a long, long time – take a run in the rain. I’d forgotten just how fun running in the rain can be! When I left my house, the temps had dropped from above 90 to the mid 70’s (we’d had showers a good chunk of the afternoon), and it was sprinkling ever so lightly. I thought that was an opportune time to get outside and beat the heat. And boy was I right! My run was amazing! It felt more like springtime than mid-summer. Mid way through my run the sprinkles became heavier, and I was running in a real shower! Not a downpour, but a steady rain. I splashed in puddles. I kicked up so much water that my legs and shorts were soaked! I looked just like I stepped out of a pool. Awesomeness! Running in the rain always brings back great memories of high school cross country. We’d run rain or shine back then – and I recall one particular run where it was literally raining cats and dogs. We finished our run on the high school baseball field – which was partially flooded. The final part of our workout was sprinting dive & slides across the water (basically and old-fashioned slip n’ slide). I loved that day, and I love remembering it. 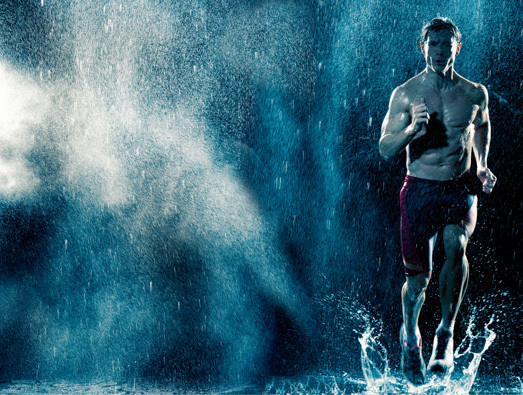 Do you run in the rain? Does it bring any special memories for you? Now, instead of the gutter, put your mind in the pool. This post is about swimming. For lots of families, summertime means swim team time. That’s certainly the case for the Tri Madness family. In fact, last weekend we attended two swim meets! My daughters swim in a rec league in our community; my son swims for a competitive team year-round. Everyone had a meet this weekend. My son’s meet was a long course meet. 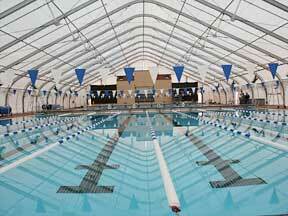 For those of you who don’t know what a long course is, it’s a 50 meter pool. Basically, it’s what you see swimmers in the Olympics swimming in. It’s roughly two times longer than the 25 yard pool that most of us swim in. I’ve never had the opportunity to swim in a 50 meter pool myself, but it seems like the transition from short course to long course would be difficult. We’re so used to taking 18-20 strokes and being able to push-off the wall. In comparison, I suspect long course feels more much more difficult as you can’t flip as often. I’m frequently astounded at how good teenage swimmers can be. Most of them (ok almost all of them) are significantly faster swimmers than I am. I guess doing 4000 yard workouts 5x per week helps you get faster. One race that particularly impressed me was the 13-14 year old 1500 meters. This distance is one that you and I have probably swam in triathlon (as it’s the “normal” distance for Olympic races”). So…I could relate my times and performance to what these kids were swimming. There were two heats for the boys – the winners both went right at 17 minutes. Just for baselining – that’s an average of 1:02 per 100 yards. I normally swim about 2 minutes per 100 yards. Wow. I was certainly impressed. I’d love to find an opportunity to swim long course. I think it would be a good experience and help my swim performance overall. What about you? Do you get to train in a long course pool? In 2009, I turned 40 years old. I had (like lots of folks) several things that were on my “bucket list” of things that I wanted to accomplish before the end of the year. One of those things was to run a marathon; the other to finish an Ironman. I dedicated the vast majority of the year towards training for these two events. 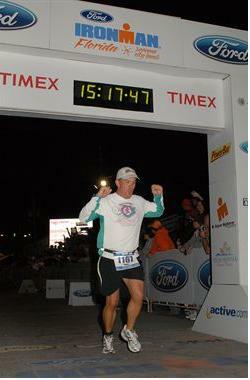 I crossed off my marathon goal in February when I finished 26.2 with Donna – the National Marathon to Finish Breast Cancer. In August, I took a stab at crossing off the other goal by competing in Ironman Louisville. Unfortunately, I didn’t quite get to cross it off. I DNF’d at mile 132. (That’s 18 miles into the marathon in case you’re counting). By the time I returned to the start/finish line and was able to call my wife back in Florida, she had already gone online and paid a ton of money to get me a community fund spot at Ironman Florida – eight weeks later. So, in early November 2009, I toed the line in the sand at Panama City and conquered my bucket list. I finished the race, and achieved my goal of “just finishing”. I think I’m finally eager to race another full distance triathlon. No longer am I comfortable with “just finishing”. I want to race. I’ve been thinking about this for several months now. I’ve run the idea past my CEO/COO (my wife). I’ve chatted with friends about it. I am almost over the mental hurdle that one must cross before committing themselves to an endeavor like this. Now comes the hard part. Deciding which race I want to do. I have defined a few parameters that most likely limit my choices. For starters, I’m interested in a late summer or early fall race. So that effectively knocks out a good chunk of the Ironman brand races. Since I live and train in an area that is as flat as your bathtub, I’m probably not looking to do a “hilly” race. That probably effectively reduces my selections as well. I’d prefer to not travel too terribly far, but that factor is probably last on my decision tree. At this point, I think my main options are Rev3 Cedar Point, Ironman Louisville (yes, I know it’s hilly – but I have a demon to slay there), Ironman Florida, Beach to Battleship and Great Floridian. There may be other late season races out there that I am not familiar with – if there are, drop me a comment with details.